Gillian talks about her background, the early days of gymnastics and cross-country running, and her entry into weight training. She also covers her training and diet secrets (including ice cream and peanut butter). The next show will be Wednesday, March 4th, 2009 at 6pm PST. The interview will be Todd Widman. 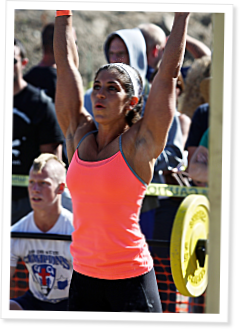 This is the 58th episode of CrossFit Radio, which aired at 6pm PDT on Friday, April 17th, 2009. This is the 35th episode of CrossFit Radio, which aired at 6pm PST on February 18th, 2009. This is the 11th episode of CrossFit Radio, which aired at 8am PST on November 30th, 2008. This is the 43rd episode of CrossFit Radio, which aired at 6pm PDT on March 11th, 2009. Thats exactly what I have been trying to figure out, I have been checkin the journal 20 times a day to see if the show with Speal has been put up. Recording issues again; I asked about it on the CFR blog and JJ got back to me. Real pity, I was looking forward to Spealler's stuff. I really wanted to hear from Spealler. As a short, light weight CrossFitter, he is my inspiration for where I can take this since I'm in the same boat stature wise. Really enjoyed the interview w/ Gillian. Awesome insights, and so genuine. I am so looking forward to the games in July.